Browse: Home / Commix v-0.2b released : Automatic All-in-One OS Command Injection and Exploitation Tool. 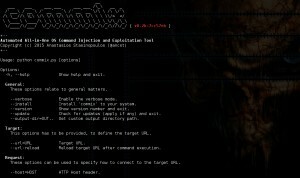 Commix v-0.2b released : Automatic All-in-One OS Command Injection and Exploitation Tool. A collection of pwnable VMs, that includes web apps vulnerable to command injections. + Exploiting DVWA (1.0.8) command injection flaws. + Exploiting bWAPP command injection flaws (normal & blind). + Exploiting ‘Persistence’ blind command injection flaw. + Exploiting shellshock command injection flaws. + Upload a PHP shell (i.e. Metasploit PHP Meterpreter) on target host. + Upload a Weevely PHP web shell on target host. + Exploiting cookie-based command injection flaws. + Exploiting user-agent-based command injection flaws. + Exploiting referer-based command injection flaws. + Rack cookies and commands injection. These options can be used, to enumerate the target host. ← Dnstwist v-20150920 ~ Generate and resolve domain variations to detect typo squatting, phishing and corporate espionage.